A good opening pair is at the heart of a great ODI team. If you stroll down memory lane and recount the best limited-overs side, there will be one common denominator between all of them- a great opening pair. India, themselves, have been blessed with great opening pairs in the past. Think back to Sourav-Sachin, Sachin-Sehwag, and Sehwag-Gambhir, who, on countless occasions gave great starts to pave way for the shenanigans of their middle-order to take over. So, when the duo of Gambhir and Sehwag went into the wilderness, a concern for Dhoni and the Indian side was to find a solid pair at the top. The 2013 Champions Trophy was a momentous occasion for India, not only for the team, as they won their third ICC event in six years but it was also the tournament where they found an opening pair, which is still going strong. It was the making of Rohit Sharma- the opener and the resurgence of Shikhar Dhawan in International cricket. In the recently concluded ODI series, the duo became the fourth pair of ODI openers to accumulate 4,000 partnership runs. The duo has batted 90 times in ODI cricket and has racked up 4,040 runs at an average of 45.39 which includes 13-century stands. One of the greatest opening pair to have ever played the game and the perfect left-right hand combination at the start of ODI innings- the duo of Sachin Tendulkar and Sourav Ganguly gave a lot of joy to their fans with their belligerent partnerships that set the tone for their sides' middle-order for a better part of 12 years. In 136-innings that the duo batted together in, they racked up 6609 runs at an average of 49.32 with 23 half-century stands and 21 partnerships in excess of 100. A world champion side always has a swashbuckling opening pair that sets the tone for their side with either bat or ball. Australia dominated ODI cricket for the better part of the first decade of the 21st century and had their bases covered in both bowling and batting department. While Glenn McGrath and Brett Lee opened the bowling attack, it was the swashbuckling duo of Gilchrist and Hayden that set the tone for their side when it came to batting. Both players had their own style of putting pressure onto the opposition bowlers. While Hayden would bully the bowlers by walking down the track and hitting them over their head, Gilchrist's ferocious square cuts and his subsequent mauling of spinners was a sight to behold. In 114 innings in which the duo batted together, they racked up 5372 runs at an average of 48.49 which includes 29 half-centuries and 16-century stands. The opening pair that was ahead of their contemporaries in the fledgling stage of One-day cricket. The West Indies, not only had an enviable pace-battery that would send chills down the spine of the opposition batters but also had the batsmen who, with their swagger and panache would send the opposition bowlers. 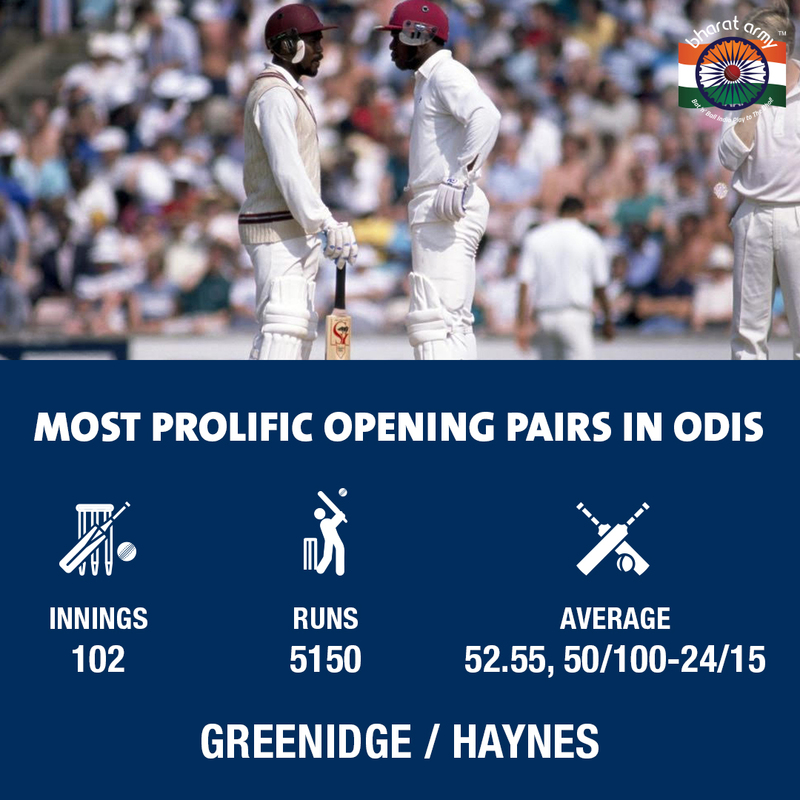 While the likes of Viv Richards and Clive Lloyd were the bedrock of the Windies' middle-order, it was the might of the opening duo of Desmond Haynes and Gordon Greenidge that paved the way for the formers shenanigans to take over. In 102 innings that the duo batted together, they racked u0 5150 runs at an average of 52.55 including 24 fifty-plus partnerships and 15-century stands.